I’ve been poking around for a zwave wired scene controller that looks like a regular switch and the gocontrol WD500Z5-1 looks like it might fit the bill. 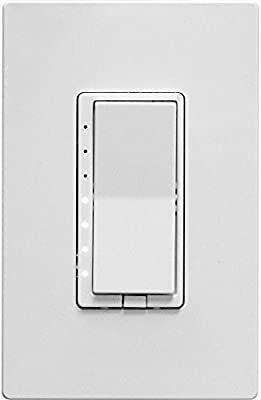 It is a regular zwave dimmer but also has support for central scene controls. I haven’t used central scene control functionally before - is support for central scenes within smartthings built into a device handler? The smartthings hub itself doesn’t have anything in particular to handle Z wave central scenes, but there are many devices which use them which are being used with SmartThings. Basically the device type handler for the device has to be written so that the central scene numbers are sent to the hub as the equivalent of individual button presses, and then the device can be treated like what smartthings calls a “button controller.” This allows it to be used with the built in automation features or with webcore. For example, there are many community members using the homeseer switches which allow for double tap and triple tap functionality through central scene commands. There are also a number of battery operated devices which use central scene commands in a similar fashion, including the Aeotec Wallmote. So it can definitely be done, but it may require custom code. Thanks - that is super helpful! I’ve been curious about creating a device type handler, so this will be a good excuse to learn. I ended up using the Inovelli Scene enabled dimmer since it turns out they support button commands on single tap up / down. I tapped off the power for the fan/light in my office (which is controlled with the home depot / hampton bay zigbee device), installing it in place of the on/off switch (not using the load of the switch at all, just the line/neutral and physical switch junction box). Normally the fan/light is controlled automatically with the 4 speed thermostat smart app / motion from a multisensor, but a single tap of the switch temporarily disables the light automation, allowing the single tap up/down to turn on and off the light. Double click has the same effect for the fan automation. I also am using triple click for my hall light that is a pullchain fixture/smart bulb so i have an alternate to alexa for controlling it. This was mostly a test setup for my guest bedroom, which will be automated most of the time, but guests will need manual control since they’d be using it as a bedroom. So far I’m pretty happy with the whole setup and kinda wish I would have used the innovelli’s around the rest of the house since the scene functionality is pretty neat.